Am I overeating or am I binging, and why? Occasionally “overeating” is a normal human experience. I put overeating in quotes is because I’m not sure that it is has a streamlined definition that I agree with. When beginning the intuitive eating process or road to eating disorder recovery, many people have told me that eating a normal amount of food feels like overeating. When I refer to overeating, I’m talking about eating past a normal sensation of fullness to the point of slight discomfort. I want you to know that it’s normal to eat a pleasurable meal and to sometimes keep munching past fullness because the food tastes SO good. It’s also normal to sometimes accidentally wait too long to eat (>4-5 hours since your last meal) and then find yourself eating more than usual when you do finally sit down for a meal because this is a normal physiological response we have to being hangry. Eating past fullness is looked down on in our culture and this creates a lot of fear around food and the thought of what might happen to our bodies. Am I eating too much? Will my body change? Am I binging? But there’s a huge difference between overeating as a natural human response to prolonged hunger versus having a binging episode, although these two terms are often used synonymously. Overeating is something that can and will happen to all of us, and our bodies are equipped to handle these occasions quite well. When you overeat, your hunger hormones and signals might stay quieter a bit longer than usual, and that’s okay. Binging, however, could indicate disordered eating, or an eating disorder. According to the DSM 5, a manual that contains diagnostic criteria, binge eating disorder is characterized as 1. recurrent episodes of eating large amounts of food, more than most people would eat in a similar circumstance in a short period of time. It includes 2. eating rapidly, eating beyond fullness and eating in secret with distress around binges. 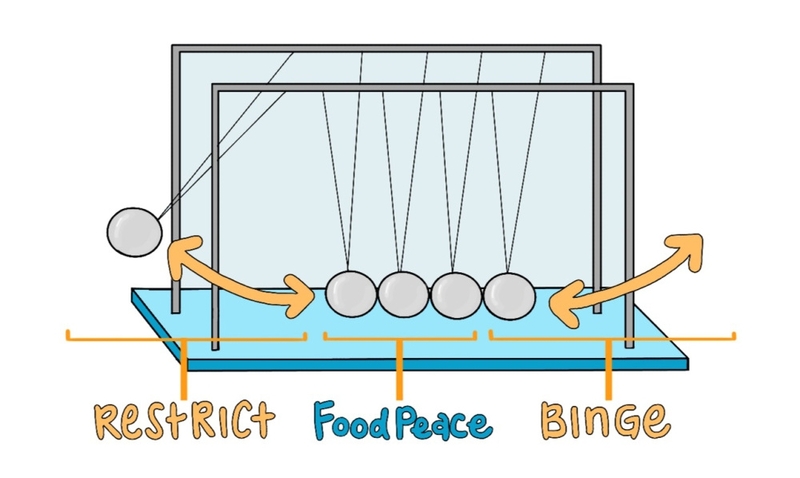 Binging can 3. cause a sense of lack of control when eating, and a disconnection with the body (zoning out, becoming unaware). 4. When someone has binge eating disorder, episodes occur once/week for three months. If you feel you meet the criteria for binge eating disorder, please reach out to an eating disorder team or visit NEDA https://www.nationaleatingdisorders.org/. Even if someone doesn’t technically meet the criteria for binge eating disorder but has binge episodes that feel shameful, this is still a problem that deserves help. Back in my disordered eating days, I remember feeling out of control with food.. I thought I couldn’t keep anything in the house because I would just scarf it down mindlessly, followed by regret and thoughts about what would happen to my body. Often it was foods like ice cream, pizza, candy, cookie dough or other foods I would not give myself permission to have. I hear clients, friends and others going through these same struggles and I want to explain where binging behaviors come from and how they can be conquered. What causes binging behaviors? Despite this common thought, it has NOTHING to do with lack of self control or being a “failure”. It actually stems from over-restriction. Have you heard the analogy of the pendulum swing? 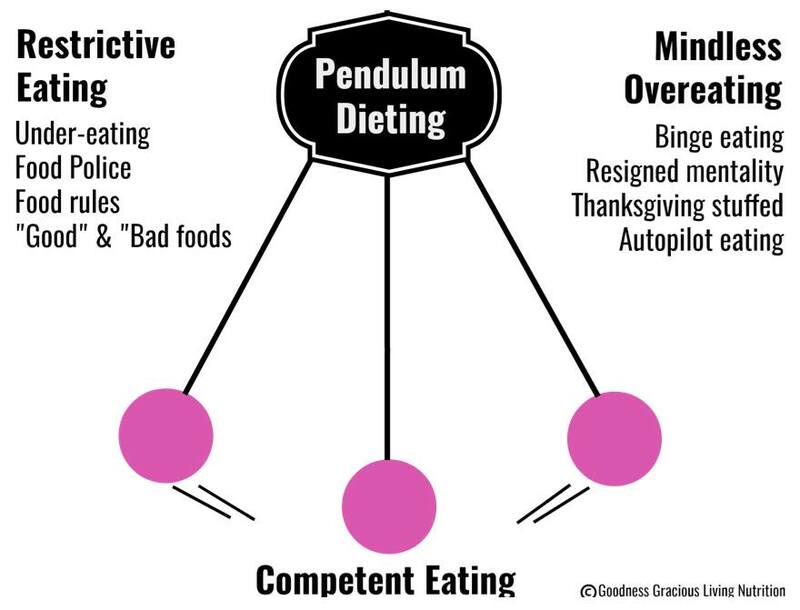 The restriction/binge pendulum swing occurs when we don’t allow ourselves to have enough to eat, AKA when we restrict. Our body will compensate later (thanks biology and the fight against famine!) by swinging from the extreme end of restriction to the other extreme end, or binging. Binges manifest as unhelpful coping mechanisms. Sometimes, feeling our feelings is hard and numbing feelings with food can elicit a sense of comfort. Binging is different from the general term “emotional eating” because frequent binging can occur due to not having helpful coping skills. Emotional eating can happen for many reasons: celebration, sadness, happiness, excitement, etc. The difference with emotional eating is that it doesn’t happen as frequently as binging and it doesn’t tend to cause distress like binging does. If we’re really thinking about it, pretty much every eating experience could be considered an emotional one because eating is meant to bring pleasure and satisfaction. Binging causes feelings of disconnection and desensitization to one’s surroundings. In order to stop binging, you have to let go of physical and mental restriction. Work on giving yourself permission to eat all foods, and to eat enough food. If this seems scary to you, have fear foods as snacks or at meals rather than on a whim; this can give you a little more peace of mind by having a plan and being prepared. Something else you may find helpful is to practice mindfulness; check in with your emotions and ask yourself, what do I really need right now? Am I hungry, or am I avoiding a feeling? If I'm avoiding a feeling-do I need to talk to a friend? A therapist? Do I need to go for a walk to clear my head, or do meditation? What would feel helpful? Often times, working through binge eating can be challenging on your own. I highly recommend and encourage you to seek professional help from a therapist and/or Registered Dietitian who is intuitive eating and health at every size informed to meet your individual needs and circumstances. You deserve peace with food and freedom from binging. Hannah Turnbull is a registered dietitian nutritionist and certified group fitness instructor. Her work empowers people to nourish and accept their bodies with intuitive eating and health at every size. Her philosophy is all foods fit, all bodies are good bodies, and that people deserve to live their most fulfilling lives without the noise of diet culture and body hatred bringing them down.